Show your respect with our beautiful standing funeral arrangement. 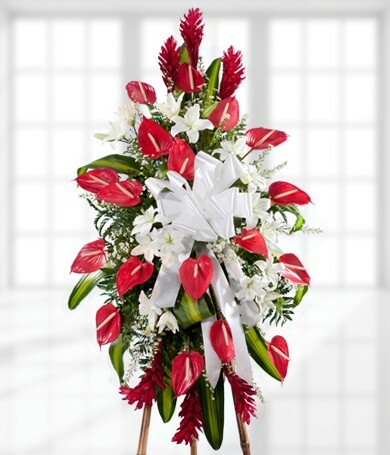 Designed to rest on a stand, this stunning tribute weaves together white lilies and red anthuriums against a background of green leaves. Have the flowers delivered to the funeral home to be displayed at the memorial, or display it at the reception. Our beautiful standing funeral arrangement shows your highest regards.